This contemporary building at the heart of Central Europes largest business zone hosts IT and telco multinationals in a business park providing excellent amenities. While this building includes major brands from telecoms and technology, the wider park brings together companies of all sizes, from almost every industry. It is easily accessible by road and public transport, and is within close proximity to the airport. Located in a dynamic business district of Bratislava, this centre offers fully furnished offices and large meeting and conference rooms provided with high speed internet connection, professional reception service and high quality services and facilities to help you run a successful business. The area is well served by public transport and has car parking facilities, as well as restaurants and cafes. Situated within an historical building in the centre of Bratislava on a quiet and convenient street, these offices benefit from a beautiful garden, free parking for six months and the use of free meeting rooms. This centre can also provide a virtual office for your company, as well as 24 hour access and security so that you can work through late hours, for however long you please with peace of mind. Within the immediate area, you can find multiple historical landmarks and museums. This stunning location in the heart of Bratislava offers a range of great work spaces including private offices, co-working options and virtual office solutions. With 24 hour access to the building you can work around the clock and at your own pace. Complimentary refreshments are provided to keep you going throughout the day, and high speed internet connectivity is available throughout. The centre also hold regular exclusive workshops and events. This business centre offers virtual office and register seat services, meeting rooms and office spaces to companies and entrepreneurs. Located in the centre of Bratislava, the building is provided with parking facilities and is surrounded by amenities and entertainment venues. Occupants of this work space solution will enjoy quality facilities, including reception services, IT support, kitchen access, virtual office options and state-of-the-art amenities. 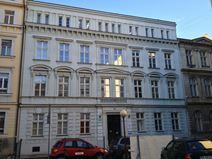 Fully serviced and wonderfully furnished offices are available on flexible terms in this prime location in Bratislava. The space is accessible 24/7, with meeting rooms you can use at your disposal. There is an administration team available on-site to assist your business with mail handling, telephone services and greeting clients. 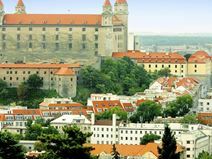 The building enjoys beautiful views of Bratislava castle and Danube River. Within a few minutes of the historic city centre this modern Class A standard building benefits from a highly accessible location that provides serviced office space in the heart of downtown and surrounded by businesses in industries that include real estate, legal and banking. Here, you can benefit from a full range of services, such as 24 hour access, allowing you to work through late hours. There is also IT support, meeting rooms and videoconferencing facilities available. Found in Slovakia's capital, this modern and contemporary business space offers a great selection of work spaces, ranging from private lockable offices, co-working solutions and meeting rooms, to virtual office options. Terms are flexible and affordable, with transparent all-inclusive fees to ensure you are not caught out by hidden fees at the end of the month. Offices are fully furnished and well equipped so you can start working straight away. Situated in a key location in Bratislava, this building consists of office spaces offering virtual office and mailing address services to companies and individuals. The office is provided with a wide range of facilities and services, including meeting room, telephone answering services and professional support staff. The area's transport links are also excellent, with Nový Most station merely walking distance from the building and the centre itself being easily accessible via numerous modes of travel. Fully furnished offices on flexible terms for forward thinking businesses that prioritise convenience, collaboration and efficiency. Turnkey office solutions offering 24 hour access and on demand administrative services to help your business run smoothly on your terms. There is a public car park, and great transport links within the locality, well within walking distance. Around the centre, there are many restaurants, cafes, bars and public interest spots.